This stunning seven bedroom Georgian style luxury home is set in generous gardens affording superb views and has been built to the most exacting standards. Beyond the rear of the property spectacular panoramic views can be appreciated across the Ribble Valley. 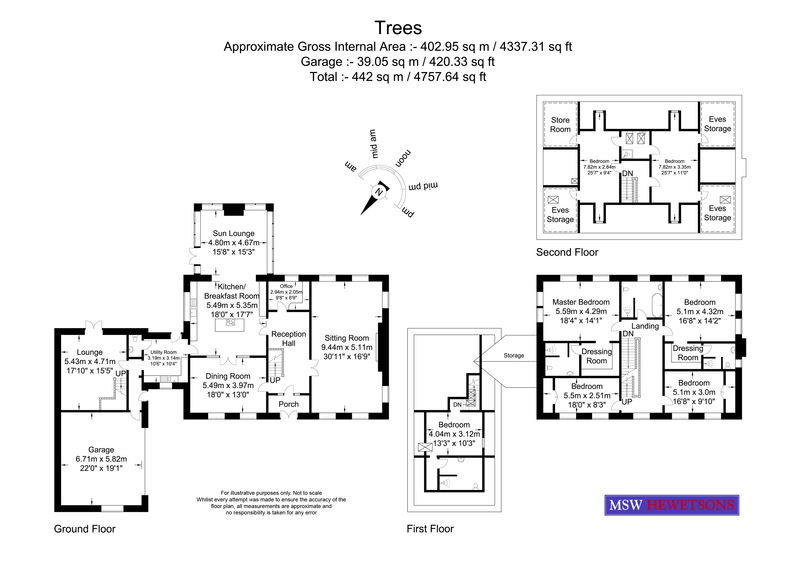 These open aspects are unrivalled and make the location of the property totally unique. Superb, light, airy and spacious lounge room with sash style windows towards the rear and side aspects, affording panoramic views across local countryside with additional sash style windows towards the front aspect, providing outlook across the front garden. Custom built fireplace and new ‘Morso’ fire installed with chimney breast built from scratch on right hand side, wall light points connected, decorative coving and two decorative ceiling roses. Two sash style windows towards the front aspect offering views across the front garden, wall light points connected, decorative coving and decorative ceiling rose, glazed bi-fold solid oak doors providing access to the dining kitchen. Sash window towards the rear aspect providing outlook across the rear garden, and with panoramic views across local countryside, fitted desk unit, decorative coving to ceiling and inset low-voltage spotlighting. Spectacular orangery with a wide variety of floor to ceiling sash style windows towards both side and rear aspects, affording panoramic views across local countryside, additional French doors giving outlook and access to the rear garden. Fireplace with ‘STUV 30’ fire installed and chimney stack built up to improve pull on fire. Designer tiled flooring and feature vaulted ceiling. Two-piece suite comprising of a designer style pedestal wash hand basin with storage under and a dual-flush low-level WC. Designer tiled flooring inset low-voltage spotlighting, extractor fan connected. Attractive arched sash style window providing outlook towards the front of the property and affording views across the front garden. Solid oak spindled balustrades with galleried view over the reception hall and an additional solid oak spindled staircase providing access to the second floor accommodation, decorative coving to ceiling and inset low-voltage spotlighting. Solid oak doors providing access to four of the bedrooms and the principle bathroom/WC. Three-piece suite comprising double sized shower cubicle with power shower over and glazed shower screen, wash hand basin and dual-flush low-level WC with concealed system. Extractor fan connected and double electric shaver point connected, designer upright chrome heated towel rail, feature tiled flooring and contrasting feature tiled splash backs. Fitted solid oak shelving to one elevation and inset low-voltage spotlighting to the ceiling. Three-piece suite comprising double sized shower cubicle with power shower over, wash hand basin and dual-flush low-level WC. Obscure sash style window towards the side aspect, designer chrome upright heated towel rail, feature tiled flooring and contrasting feature tiled elevations, extractor fan connected, inset low-voltage spotlighting. Two sash style windows towards the front aspect and offering views across the front garden, fitted wardrobes with hanging and shelving, decorative coving to ceiling. Two sash style windows towards the front aspect, offering views across the front garden, fitted wardrobes with hanging and shelving, decorative coving to ceiling. Luxury four-piece suite comprising of double sized shower cubicle with power shower over and glazed, curved shower screen, freestanding bath with mixer tap and shower attachment over, designer pedestal wash hand basin and dual-flush low-level WC. Obscure window towards the rear aspect and designer chrome upright heated towel rail, feature tiled flooring and contrasting feature tiled elevations, inset low-voltage spotlighting extractor fan connected. Solid oak spindled balustrade and inset low-voltage spotlighting to ceiling, solid oak doors providing access to a further two bedrooms. Walk-in bay window and sash style window towards the front aspect and additional walk-in bay window with sash style window towards the rear aspect, offering panoramic views across local countryside. Two walk-in storage cupboards providing useful storage space, inset low-voltage spotlighting to ceiling. French doors and additional arched window providing outlook and access to the rear garden and affording panoramic views across local countryside. Feature vaulted ceiling and solid oak spindled staircase providing access to the mezzanine bedroom with additional Velux skylight providing extra light. Three-piece suite comprising double sized shower cubicle with power shower over and glazed shower screen, wash hand basin and dual-flush low-level WC. With concealed system. Extractor fan connected and double electric shaver point connected, designer upright chrome heated towel rail, feature tiled flooring and contrasting feature tiled splash backs. Fitted solid oak shelving to one elevation and inset low-voltage spotlighting to the ceiling. Electronically operated gates provide access to a courtyard, which in turn provides ample off-road parking and in turn provides access to the front door and the double garage. To the front of the property a superb well stocked and maintained garden area can be appreciated, laid mostly to lawn with a variety of mature deciduous trees complimented by shrub and floral displays. The garden is enclosed by a fence with open access to the side garden with an additional cast-iron gate providing pedestrian access. Landscaped front garden including new path to compost heap, completely resurfaced driveway in Indian stone inlcluding lighting in borders. New fencing at right hand side of property. Double garage with electric up Andover door and attractive arches double-glaze sash style window towards the front aspect, power, light and water supply connected. Solid oak door providing access to the inner lobby of the ground floor, providing ample secure off-road parking. Wood storage shed built to side of garage. To the side and rear of the property landscaped garden areas can be found comprising of a spectacular stone flagged patio area which opens out to a garden laid mostly to lawn with shrub and floral borders. The rear garden is private and not overlooked with open aspects and green belt land beyond. Further features include an outside water supply, electricity and lighting. Gate to wood shed. Childs play area to rear with ‘soft’ area. All mains services are installed CCTV system covering all corners of the property (8 cameras). LED lighting throughout. Valliant warm air re-circulation system and UPvC double glazing. Please Note: MSWHewetsons, their clients and any joint agents give notice that; They are not authorised to make or give any representations or warranties in relation to the property either here or elsewhere, either on their own behalf or on behalf of their client or otherwise. They assume no responsibility for any statement that may be made in these particulars. These particulars do not form part of any offer or contract and must not be relied upon as statements or representations of fact.